Recent animal and human studies have suggested that acetaminophen has endocrine-disrupting properties. Using the Danish National Birth Cohort of 64 322 live-born infants and their mothers, Liew and colleagues studied behavioral problems in children after prenatal exposure to acetaminophen. Prenatal exposure to acetaminophen was associated with an increased risk in children of receiving a hospital diagnosis of hyperkinetic disorder or attention-deficit/hyperactivity disorder (ADHD) medication and of exhibiting ADHD-like behaviors, with higher use frequency increasing the risk in an exposure-response manner. In their editorial, Cooper and colleagues discussed the implications of the study and the need to remain vigilant to the potential adverse effects of medication as new evidence comes to light. Schools are considered an attractive setting to promote healthy living behaviors in children, but previous school-based interventions aimed at preventing weight gain in children have yielded mixed results. Santos and colleagues conducted a cluster-randomized clinical trial in 19 elementary schools with older students teaching younger students about nutrition, physical activity, and body image. Waist circumference declined significantly and self-efficacy, healthy living knowledge, and dietary intake significantly improved in younger peers who received the intervention compared with control individuals. These positive effects suggest that the Healthy Buddies lesson plans are a viable and effective option for addressing childhood obesity and increasing healthy living knowledge within elementary schools. A better understanding of the cause of obesity is a clinical priority. Llewellyn and colleagues found that a polygenic risk score comprising 28 common obesity-related single-nucleotide polymorphisms was negatively related to satiety responsiveness and positively related to adiposity. 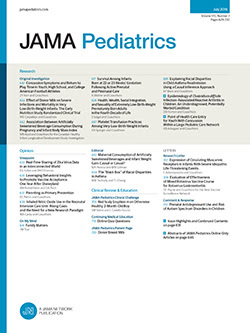 In an accompanying editorial, Belsky discussed how this study, along with the study by van Jaarsveld and colleagues in this issue, highlights an interdisciplinary approach to pediatrics research that has the potential to inform prevention and treatment not just for obesity, but for a range of common chronic health problems that begin to develop during childhood. Previous studies have demonstrated that a healthier appetite in infancy is a risk factor for more rapid weight gain, but to date no investigations have been able to rule out familial confounding. Using a cohort of dizygotic twins, van Jaarsveld and colleagues found that those with a heartier appetite (higher food responsiveness and lower satiety responsiveness) in early infancy had more rapid growth up to age 15 months than their siblings. Belsky discussed these findings, as well as those of the study by Llewellyn and colleagues, in a related editorial.